The Cleveland Indians‘ season is over. It ended yesterday in a playoff series which, honestly, couldn’t even be politely labeled as watchable. The team was out-played at every level by a far more motivated Houston Astros club, outscored 21-6 in three games. It was frustrating. It was a let-down. It was yet another wasted opportunity from a team which doesn’t have the benefit of time when it comes to its window of contention. The one thing it wasn’t, though, was surprising. If you followed this Indians team throughout the 2018 season, you realize this result was beyond predictable. Sure, it’s a bit perplexing looking at a roster boasting an All-Star at every position and a rotation featuring four 200-strikeout pitchers and watching as it fails to win a single playoff game. Cleveland is stacked with talent, which makes the season ending on a whimper quite confusing. Again, though, to say this outcome was a surprise is off-base. After all, when you spend an entire season underachieving, how can you not expect such a habit to lead to your playoff demise? Opening the year by telling us how much they learned from last year’s ALDS flop against the New York Yankees, how the goal was to finish the job this time, the Indians instead spent most of the season on cruise control. They never had a dominant string of games, no attention-grabbing winning streaks. no overwhelming performances against the league’s top tier teams. Instead, it was six months of lackadaisical play, mostly due to the fact the rest of the AL Central was historically terrible. When it appeared the division was already in hand back in May, Cleveland never felt motivated to play competitively. The team instead just moseyed through the year, under the belief all the issues we were witnessing would just get fixed come playoff time. Things look concerning now, they insisted, but no worries, they’ll just flip the switch in the postseason. Instead of looking like a legit World Series contender, the Indians watched as all the bad habits, all the bad narratives, everything which made this such a frustrating regular season, followed them into the playoffs. 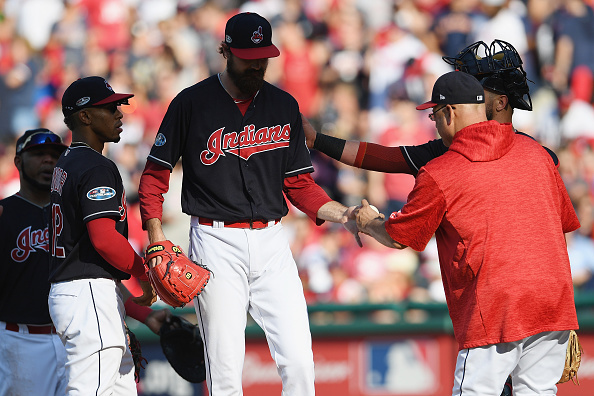 We were told ace Corey Kluber‘s questionable showings on the mound were not being affected by any sort of injury. The team prioritized finding room for Jason Kipnis by relocating him to center field despite his having a disastrous season at the plate. Everyone assumed Jose Ramirez‘s hitting slump, which dates back to August, would just vanish come October. The bullpen, a sore spot for the team all year long, would clearly become reliable when it mattered most. These are just some of the problems we were told not to worry about. Ones which, once the calendar turned to October, the team would just buck on its way to a deep playoff run. That didn’t happen either. Each of the aforementioned issues helps to explain why the Indians are watching the rest of the postseason at home. And that’s the problem. For the second straight year, the Indians got caught assuming. Last year, they assumed they’d get back to the World Series because they were there previous season. They went up 2-0 on the New York, and just figured their opponent would lay down. This year, they barely put in any effort dating all the way back to June, under the assumption it didn’t matter, that they’d just hit their stride as soon as the games mattered. Why waste effort in July and August when you can save the energy for the big games? Believe it or not, this backfired, too. Essentially, you have a team which, twice, insisted it knew what it had to do to finally complete the job left unfinished in 2016. And, twice, it instead just shrugged off the necessary effort and figured wins occur if you have a good team on paper. At the end of the day, you can be mad about how this season finished. You can express frustration and disappointment. What you shouldn’t be, though, is surprised. The Indians team we saw put up zero fight in October is the same one we watched show minimal effort all season long. As a result, exiting the playoffs in pathetic and embarrassing fashion was the most likely conclusion to a season like this.